The First Official iOS Game Controller Is Here. It's Okay. The MOGA Ace Power is the first Apple certified, iOS 7 compliant video game controller on the market. No one can take that away from manufacturer Power A, even a mobile gaming hardware reviewer who thinks it feels like a child's toy. When the MOGA line of Android video game controllers was first announced, companies like Power A and it's rivals were frustrated that their mobile ingenuity could not find a home on Apple devices. Apple did not want game controllers interfering with its pristine, all-inclusive touchscreen phones and tablets. A year later, the maker of iPads, Pods and Phones announced controller support coming with the release of iOS 7. Since then I've been eagerly awaiting news of an official Apple approved game controller, but the flood I expected hasn't come. Logitech has teased, but Power A seems to have beat them out of the gate. The MOGA Ace Pro should be available online and in Apple stores soon. Why, it's this thing right here. The MOGA Ace Pro takes a relatively standard game controller layout and wraps it around an iPhone 5, 5S, 5c or fifth generation iPod Touch. Here's what the unit looks like closed. 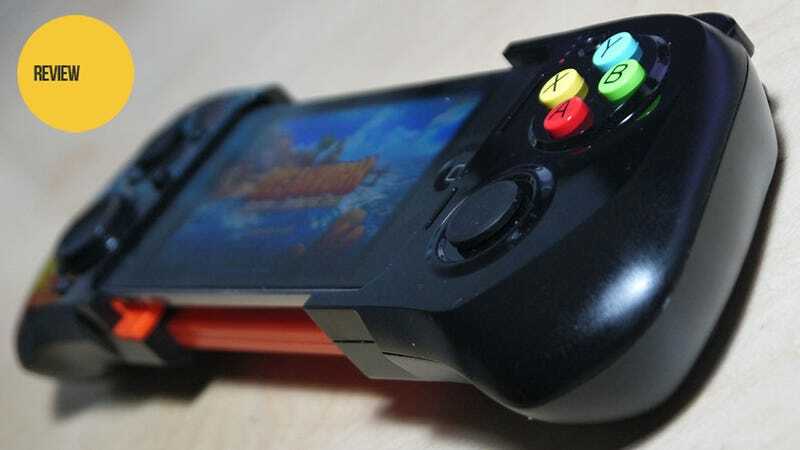 Closed, it's about the size of smaller MOGA android controllers like the recently-released MOGA Hero Power. Open, with a suitable iDevice plugged into its lightning connector, it's about an inch and a half longer than the Sony PlayStation Vita, a particularly long portable gaming device in its own right. The MOGA Ace Power gives mobile gamers console-style controls for games that support Apple's controller standard. People who really hate touchscreen controls for games, for starters. There are plenty of iOS games out there that feel like they were built with a game controller in mind but, for lack of such a device, ended up with clumsy virtual directional pads and buttons cluttering up the screen. Console and PC ports like Bastion and Limbo definitely fit the bill, as does the recent iOS adventure Oceanhorn. It's a device for anyone who has questioned why they need both a dedicated gaming portable and a smart phone. I played games with it, of course. Power A supplied me with a loaner iPod Touch (I have no iPhone, sad to say), with a selection of pre-installed games for me to play. These included Limbo and Bastion, the zombie shooter Dead Trigger 2, space combat sim Galaxy on Fire II HD, platforming shooter Fur Fighters, and a pair of horrible games called Otto Matic and Bugdom 2, which should never be used to demonstrate anything ever. I also downloaded Oceanhorn, an amazing adventure game recently released on iOS with controller support, and Trouserheart, a game that claimed controller support but apparently had no idea what it was talking about — it did not work. It Controls Things — The MOGA Ace Power, when used in conjunction with a supported game, does indeed grant players access to console-style controls for their mobile games. With the iPod Touch firmly docked and a good game running, it's easy to forget you're playing some strange amalgam of phone/MP3 player and game controller. At its best, it really feels like a new sort dedicated portable gaming system. It Charges Things — The MOGA Ace Power, like its Android brethren, has the ability to lend juice to your iDevice. Unlike the Android versions, this requires no additional cord. As long as the MOGA's charge is above 25 percent, a simple flipped switch sends power coursing through your phone. It's All Clever — From the locking device to the front-faced power button, which is simple a toggle that presses the power button on your phone or iPod, the MOGA Ace Pro is a clever little device. This is top-notch design, even if much of it was dictated by Apple. It Looks Cheap — Well, just look at it. Those candy-colored face buttons, the brand-justified color scheme, the smooth black plastic — it doesn't look like something I'd want to slide my expensive phone into. "Is that the new iPhone 5s?" "Sure is!" "What the hell did you do to it?" It Feels Cheap — Without a device docked, the MOGA Ace Pro could be confused with a broken toy. There's obviously a bit missing there (where the phone goes), in the middle of all that black and orange plastic. It rattles when shaken, and since only one side locks, it slides halfway open with the slightest shake. Much of this is the nature of the device, but there has to be a way to make a controller that slides open while still feeling like a solid piece of equipment. The Worry Game — More games that support iOS controllers are surely coming, but the fact that Power A had to pre-load a pair of cheap and horrible action games like Otto Matic and Bugdom 2 on the evaluation device doesn't say much for the current state of affairs. It's really not quite as final as all that. The MOGA Ace Power is the first Apple certified iOS 7 controller I've gotten my hands on, and likely the first to market. that's a blessing and a curse. As of right now it's the only game in town, so its cheap feeling and looking construction might be overlooked. It's got the function, if not the form. It's really too soon to say — we don't even have a price for this thing yet, just a page where we can sign up to be informed when it's available to order. Power A has fired the first shot in the battle for the iOS video game controller market, but in doing so they've betrayed their position. Now the other controller makers know where to aim. Should be an interesting fight.